Your purchasing process—cost-effective and more streamlined than ever before. Time, like every budget, is finite. Purchasing technology can be overwhelming when considering the process from selection and approvals to purchase order release to delivery and deployment, but with Virtucom, it doesn’t have to be. Virtucom’s dedicated team of IT professionals help you through the product fulfillment process with the same knowledge, guidance, and unwavering support that you give students. Throughout our 20+ years of providing technology solutions, we’ve established and maintained relationships with the industry’s biggest names. Our premier status with partners not only affords your school special price discounts, but the ability to work with and prioritize fulfillment to ensure we meet your goals and timeline. 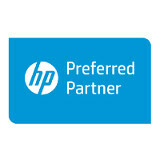 We don’t stop at simply helping you select your technology. We provide tools and resources to simplify, automate, and improve the efficiency and communication of the fulfillment process. Our e-commerce platform, V-Central, synchronizes your data and unique activities for streamlined purchasing. Use our platform to stay efficient, and take advantage of features like real-time pricing, availability updates, and report generation. V-Central automates your purchasing process, reducing legwork and human error—getting your students the technology they need as soon as possible. Just as an educator’s job doesn’t end when the dismissal bell rings, Virtucom’s support doesn’t end with the transaction. From procurement to implementation to maintenance, we oversee all facets of your IT infrastructure, leaving you more time to prepare students for a bright future. 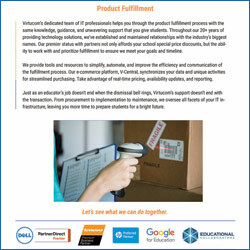 Learn more about our product fulfillment solutions today. Connect with us to get started.